Dr Jennifer Otter Bickerdike (University of East London) delivered the first of the Centre for the History of the Emotions lunchtime seminars earlier this year. Here, she tells us how she came to her PhD topic, which explored memory and mourning via the grave of Joy Division frontman Ian Curtis. For most tourists, a first trip to England includes the must-sees of Buckingham Palace and the Crown Jewels. For me, it was Salford Lads Club, the space where the Hacienda club used to stand (the club is now gone, replaced with upscale apartments attracting local footballers), and the grave of Joy Division’s Ian Curtis. I felt an unexplained draw to visit, repeatedly, the spaces and places that had played a part in the history of the music of Manchester – music that I, as an American, had only experienced through watching videos, reading books and fanzines, and dancing like a raving loon to the key records, both in the privacy of my own home and at local indie clubs where such anglophilism was encouraged, celebrated and promoted. I had never visited the graves of my own grandparents, people I knew and loved very deeply, yet felt compelled to walk the streets that my northern heroes had strode down and contemplate at their graves, my sonic pilgrimage always scored by the appropriate record. When it came to choosing a topic to study for the three years of my PhD, it seemed natural to be introspective, looking to why I did this and what it meant. 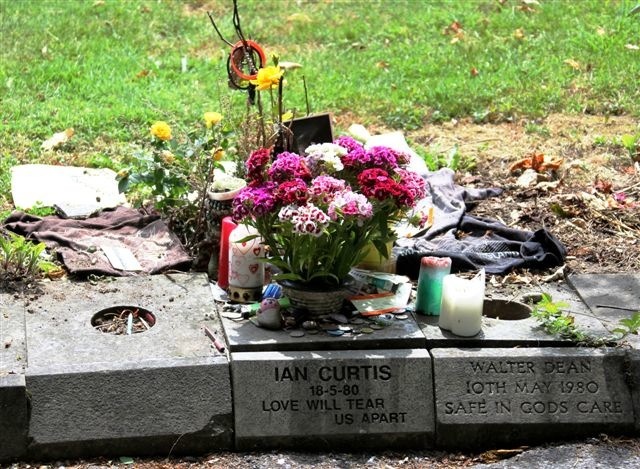 For one year, I went to the grave of Ian Curtis on the same day of the month every month, recording the trash, trinkets and tributes left at his memorial stone. Through this, I saw not only the devout, almost religious fervor of fans, but the cycles of life, decay and renewal. The Curtis legend becomes transformed through every visitor as their personal meaning is applied to the canvas of the singer, changing and evolving his ‘story’ a tiny bit at a time. A similar pattern of degradation and renewal occurred in the area surrounding the grave: items were left, items decayed, new items found their way in. The seasons changed, one to another, each with their own signs of time slowly but surely moving forward. Throughout the process, I realized that I was but one of many loving and celebrating this exported notion of Britishness. It was not exclusive to my little circle of Californian friends with shaggy Ian Brown bowl cuts and denim flares; this was a communion not just of music, but of ideas, culture and history that had been telegraphed globally to take on a much greater meaning in this newly minted idea of ‘past’ than had ever actually existed in any present. It is this ‘past’, one based on – as Tony Wilson once said, a “fiction much more interesting than fact” – that is circulated, mourned and remembered. Visitors to the Ian Curtis memorial stone illustrated this: a longing for a person, moment and space which may never have truly existed, but that live on in a nostalgic ether of perceived greatness, soaring to meteoric heights in a shared cultural memory. You can read more about Jennifer’s research in this area on her blog, Joy Devotion. This entry was posted in Art and emotion, General, Queen Mary Events and tagged death, emotion, mourning, music and emotion, nostalgia, religion, shrines, tears by Jennifer Otter. Bookmark the permalink.